Faculty of Applied Bioscience, Kanagawa Institute of Kanagawa, Atsugi, Japan. Copyright © 2013 Miki Kubo et al. This is an open access article distributed under the Creative Commons Attribution License, which permits unrestricted use, distribution, and reproduction in any medium, provided the original work is properly cited. In accordance of the Creative Commons Attribution License all Copyrights © 2013 are reserved for SCIRP and the owner of the intellectual property Miki Kubo et al. All Copyright © 2013 are guarded by law and by SCIRP as a guardian. The ability of heated scallop-shell powder (HSSP) to disinfect Escherichia coli ATCC 25922 biofilm was investigated. On account of its cryotolerance and cell surface characteristics, the E. coli strain is reportedly a useful surrogate for E. coli O157: H7 in surface attachment studies. In this study, an E. coli ATCC 25922 biofilm was formed on a glass plate, and immersed in a slurry of HSSP. Following treatment, the disinfection ability of the HSSP toward the biofilm was non-destructively and quantitatively measured by conductimetric assay. The disinfection efficacy increased with HSSP concentration and treatment time. HSSP treatment (10 mg/mL, pH 12.5) for 20 min completely eliminated biofilm bioactivity (approximately 108 CFU/cm2 in non-treated biofilms). In contrast, treatment with NaOH solution at the same pH, and treatment with sodium hypochlorite (200 mg/mL) reduced the activity by approximately one to three log10. Fluorescence microscopy confirmed that no viable cells remained on the plate following HSSP treatment (10 mg/mL). Although alkaline and sodium hypochlorite treatments removed cells from the biofilm, under these treatments, many viable cells remained on the plate. To elucidate the mechanism of HSSP activity against E. coli ATCC 25922, the active oxygen generated from the HSSP slurry was examined by chemiluminescence analysis. The luminescence intensity increased with increasing concentration of HSSP slurry. The results suggested that, besides being alkaline, HSSP generates active oxygen species with sporicidal activity. Thus, HSSP treatment could also be effective for controlling biofilms of the toxic strain E. coli O157: H7, implicated in food poisoning. Bacteria can become tenaciously attached to food and its contact surfaces by forming biofilms . Biofilms are more resistant to environmental stresses such as nutritional and oxidative stresses, desiccation, UV light exposure, and sanitizing agents, than free microorganisms . Biofilms attached to food contact surfaces such as stainless steel, polyvinyl chloride and polyurethane are a continuous source of food spoilage bacteria and pathogens in food processing environments [3-6]. Among the biofilm-forming species is the enterohemorrhagic strain Escherichia coli O157:H7 . Enterohemorrhagic E. coli strains produce Shiga-like toxins, and E. coli O157:H7 infection is potentially fatal, particularly in young children and the elderly [8,9]. Previous studies [10,11] have demonstrated the strong antibacterial activity of heated scallop-shell powder (HSSP). The main component of scallop-shells is CaCO3, which, when heated, generates the powerful bactericidal agent CaO . In fact, the antibacterial activity of powder heated to 1000˚C is comparable to that of pure CaO . HSSP treatment effectively reduces the aerobic bacterial count in shredded cabbage  and kills Bacillus subtilis spores [14,15]. We have previously investigated the disinfection efficacy of HSSP against biofilms of Salmonella sp. and Staphylococcus aureus . HSSP treatment (10 mg/mL, pH 12.5) completely eliminated bioactivity of the biofilm (approximately 107 CFU/cm2 in non-treated biofilms) and was more effective than or nearly as effective as sodium hypochlorite (200 ppm = 200 mg/L) against Salmonella sp. and S. aureus, respectively. In contrast, treatment with NaOH was less effective than HSSP slurry at the same pH. Bodur and Cagri-Mehmetoglu  also reported that HSSP treatment removed biofilms of three pathogens, Listeria monocytogenes, S. aureus and E. coli O157:H7, formed on stainless steel plates. In the present study, we investigated the disinfection efficacy of HSSP against biofilms of E. coli ATCC 25922 on glass plates. This E. coli strain is reportedly a useful surrogate for E. coli O157: H7 in surface attachment studies, since it is cryotolerant and possesses desirable cell surface characteristics . The cell populations of apples contaminated with E. coli ATCC 25922 and E. coli O157: H7 were similarly reduced after washing the apples with hydrogen peroxide . The two strains are similarly resistant to alkaline pH and heat  and similarly sensitive to gamma radiation in meats  and UV pasteurization in apple cider . In the present study, biofilms grown on glass plates were subjected to HSSP treatment, and the metabolic and growth activities of the cells were determined by conductimetric assay, without disrupting the biofilm structure. The viability of the E. coli ATCC 25922 cells remaining on the plate after HSSP treatment was determined by fluorescence microscopy. In addition, to clarify the mechanisms of disinfectant efficacy, the active oxygen generated from the HSSP slurry was investigated by chemiluminescence analysis. Escherichia coli ATCC 25922(=NBRC15034) was purchased from the National Institute of Technology and Evaluation Biological Resource Center (NRBC). The bacteria were stored in 10% glycerol solution at −85˚C. Prior to experiment, they were thawed and pre-incubated in nutrient broth (Eiken Chemicals Co. Ltd., Tokyo, Japan) at 37˚C for 24 h. The pre-incubated E. coli ATCC 25922 cells were washed and resuspended in 10 mL sterile saline. A portion (0.1 mL) of the bacterial suspension was added to a 100-mL plastic vial (IWAKI, Asahi Glass Co. Ltd.) containing 40 mL of Todd-Hewitt Broth (Oxoid, Cambridge, UK). A sterilized slide glass plate (76 × 26 mm, Matsunami Glass Ind. Ltd., Tokyo, Japan) was immersed in the broth and incubated at 37˚C for 48 h (110 strokes/min). Following incubation, the plate was removed from the broth and gently washed twice with 10 mL sterile deionized water (hereafter, this plate is called the BF plate). For the conductimetric assay, a small piece (10 mm × 26 mm) of the prepared biofilm plate was cut with a diamond cutter. Powder from scallop-shells (Patinopecten yessoensis) was obtained from Soycom Co. Ltd. (Atsugi, Kanagawa, Japan). The powder was heated at 1000˚C in air for 1 h and ground in a ball mill. The approximate mean size of the HSSP particles was 5 µm. The calcium and magnesium content of scallop shell powder heated at 1000˚C for 1 h was 70.8 wt% and 0.16 wt%, respectively. Trace amounts of phosphorus (0.073 wt%), sodium (0.014 wt%), and iron (0.003 wt%) were also present. Silver and copper, which possess antibiotic properties, were not detected (<0.01 mg/kg). At a calcium concentration of 70.8 wt%, the shell contains 99% CaO by weight (Sawai et al., 2001). The powder was mixed with sterile saline (0.85 w/v%) to produce a slurry. The prepared biofilm plate was immersed in a vial containing the prepared HSSP slurry (100 mL) and incubated at 37˚C (110 strokes/min). The above procedure was repeated for sodium hydroxide (NaOH) and sodium hypochlorite (Wako Pure Chemical Industries) treatments. NaOH and sodium hypochlorite were solubilized in sterile deionized water. Electric conductivity was measured by a RABIT™ (Rapid Automated Bacterial Impedance Technique) system (Don Whitley Scientific Ltd., UK). Conductivity was measured in a capped sample tube containing paired electrodes at the bottom. Conductimetric assays detect microbial growth and metabolism as changes in the electrical conductivity or impedance of the growth medium . Such conductivity changes indicate the presence of electrolytes produced by metabolic activity, such as the conversion of glucose to lactic acid and/or increased mobility caused by the cleavage of large charged molecules (such as proteins) into smaller, more mobile charged molecules (such as amino acids). When the difference between two successive electrical conductivity measurements of the medium exceeds 5 µS, the RABIT™ system detects the change. The time required to reach the threshold concentration is called the TTD (time to detection); the TTD values may be used as criteria for determining bacterial growth . The BF plates exposed to HSSP or other treatments were gently washed twice with 10 mL sterile deionized water, and immersed in the RABIT sample tubes containing 5 mL Whitley Impedance Broth (WIB: Don Whitley Scientific Ltd.). An untreated BF plate was used as a control. The tubes were set in the incubator module, and the conductivity changes in the growth medium, induced by metabolism and growth of E. coli, were monitored at 37˚C at 6 min intervals for 48 h.
Growth of E. coli ATCC 25922 was calibrated from the planktonic cells and the cells attached to the glass plate. To assess planktonic cell growth, serial ten-fold dilutions of E. coli suspensions were prepared with sterile saline. A 0.1 mL aliquot of each diluted suspension was added to the RABIT sample tube containing 5 mL WIB, and the conductivity change was measured at 37˚C for 48 h at 6 min intervals. For assessing the growth of cells attached to the glass plate, serial ten-fold dilutions of suspended cells were also prepared with sterile saline. A 5 mL aliquot of E. coli suspension was spread onto the glass plate (10 mm × 26 mm) and dried. The dried plate was immersed in the RABIT sample tube containing 5 mL of WIB, and the conductivity change was measured at 37˚C for 48 h at 6 min intervals. The BF plates exposed to HSSP and other treatments were stained with LIVE/DEAD BacLight™ Bacterial Viability Kit (Invitrogen Co., CA, USA). This assay uses SYTO9 and propidium iodide (PI) to discriminate between live cells with intact membranes (green fluorescence) and dead cells with compromised membranes (red fluorescence). The cells were stained according to the manufacturer’s instructions. The stained BF plate was examined by fluorescence microscopy (Olympus FV1000D IX81, Tokyo, Japan). Active oxygen species generated from the HSSP react with luminol and trigger a chemiluminescent response, as described by Kohtani et al. . A Mithras LB09470 microplate reader (Berthold Technologies, Bad Wildbad, Germany) was used for measurements. Samples of HSSP slurry (100 μL) were pipetted into 96-well microplates, and the chemiluminescence reaction was initiated by adding 50 μL of 0.7 mM luminol (Nacalai Tesque, Kyoto, Japan). Chemiluminescence was then recorded by the microplate reader. To examine the effects of antioxidative enzymes, 25 µL of 0.1 mg/mL superoxide-dismutase (SOD) or 0.1 mg/mL catalase solution (Wako Pure Chemical Industries) was added to the wells from the dispenser prior to luminol addition. Each experiment was performed in triplicate and the average values are reported in the results. 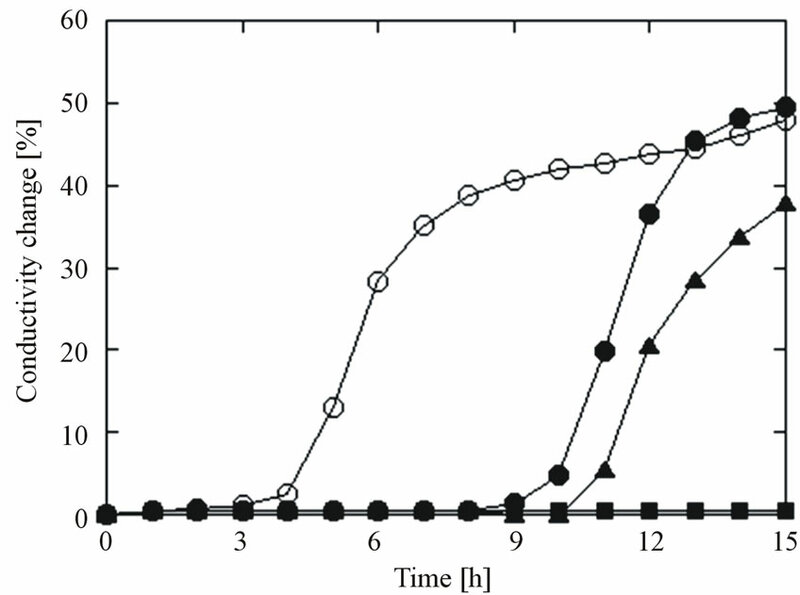 Figure 1 plots the typical conductivity curves for E. coli ATCC 29522 biofilm treated with 0.1mg/mL HSSP. The ordinate is the conductivity change (%) in the WIB growth medium. The conductivity of the untreated biofilm plate became detectable at approximately 4.5 h (i.e. TTD = 4.5 h). TTD was delayed at longer treatment times, being 10.7 h and 11.3 h after treatment for 20 min and 40 min, respectively. No TTD was detected after 60-min treatment. Figure 1. Typical conductivity curves for E. coli ATCC 25922 biofilms treated with HSSP at 0.1 mg/mL (pH = 11.6). ○: control, ●: 20 min, ▲: 40 min, ■: 60 min. Data points with bars represent means ± standard error. Figure 2. Calibration curves of E. coli ATCC 25922; planktonic cells (○) and cells attached to the plate (●) in conductimetric assays. Data points with bars represent means ± standard error. number of E. coli cells inoculated in the RABIT sample tube, obtained by the plate count method. For cells in both states, the TTD shortened as the initial number of inoculated cells increased. However, at a given TTD value, the populations of E. coli cells in the biofilm estimated from the planktonic-cell calibration curve were underestimated by two or three orders of magnitude. Since the number of viable attached cells better matched the proliferation values for biofilms in the RABIT tube than the number of viable planktonic cells, the viable cell counts in HSSP-treated biofilms were estimated from the attached-cell calibration curve (the conversion equation is: viable cell counts [log CFU/tube] = −0.38 × TTD + 10.7; R2 = 0.97). 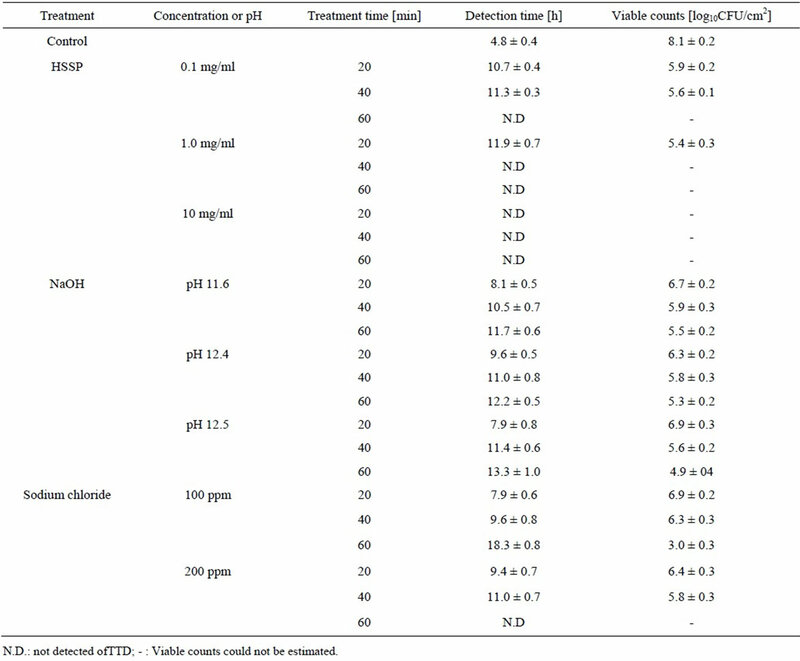 The viable counts estimated from the calibration curve of the attached cells are summarized in Table 1. The estimated viable cell count in the control biofilm was 8.1 log CFU/cm2. HSSP treatment (0.1 mg/mL) for 20 and 40 min reduced the viable count by two log10. No conductivity changes occurred after HSSP treatment at 0.1 mg/mL for 60 min, indicating that the E. coli cells in the biofilm were completely dead. Increasing the HSSP concentration to 1.0 mg/mL caused an approximately 2.5-order reduction in viable cell count after 40 min, and no TTD was observed at longer treatment times. At 10 mg/mL, HSSP treatment for 20 min completely suppressed activity (i.e. no TTD was detected). In contrast, NaOH treatment at pH 12.5 (the pH of 10 mg/mL HSSP slurry) reduced the viable cell count by one to three orders of magnitude. Although no TTD was detected after 60 min treatment with 200 ppm sodium hypochlorite, sodium hypochlorite was less effective than HSSP at both concentrations. Table 1. Estimated viable counts in E. coli biofilms exposed to HSSP and other treatments. cells (red). Most of the E. coli cells in this biofilm were left intact. Treatment with HSSP (10 mg/ml, pH 12.5) and NaOH (31.6 mM, pH 12.5) for 40 min removed a large portion of the biofilm and killed the remaining E. coli cells (Figures 3(b) and (c)). The stripping and killing effects increased with treatment time (data not shown). Following treatment with 10 mg/ml HSSP for 40 min, no intact cells remained. In contrast, following NaOH treatment at pH 12.5 (the pH of 10 mg/ml HSSP), a larger portion of the biofilm remained, and active cells were present. Although treatment with 200 ppm sodium hypochlorite for 40 min also stripped a significant proportion of the biofilm, active cells were clearly retained on the plate (Figure 3(d)). The conductimetric assay yielded identical results. In our previous study , active oxygen species were generated from CaO, the main constituent of HSSP. We therefore investigated whether active oxygen species were generated from the HSSP slurry. The chemiluminescent response of HSSP following luminol addition is shown in Figure 4. 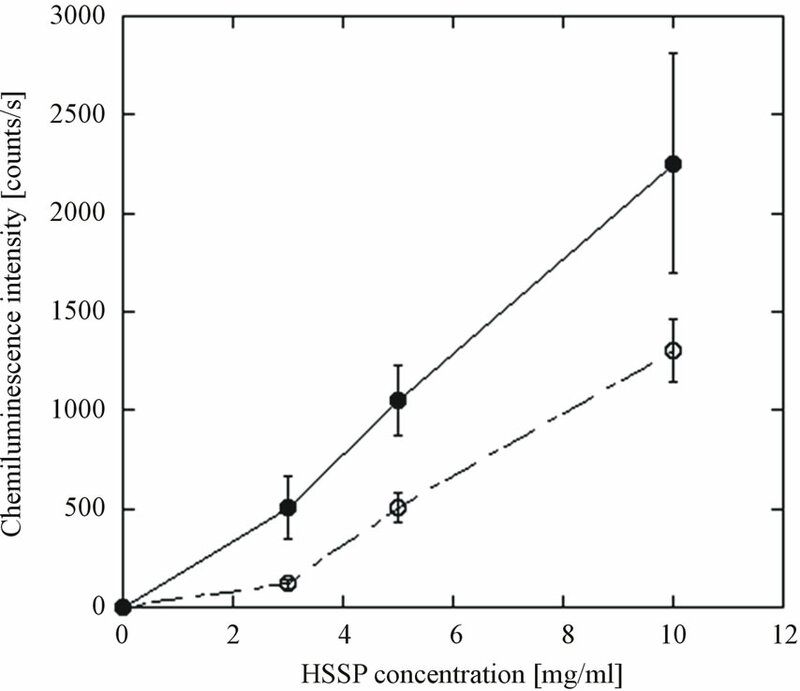 The chemiluminescence intensity evoked by HSSP increased with increasing HSSP concentration. Moreover, chemiluminescence intensity was reduced by SOD addition, indicating a possible involvement of superoxide ( ). Figure 3. Fluorescence microscopy images of E. coli ATCC 25922 biofilms grown on glass plates. (a) Untreated biofilm; (b) Treatment with 10 mg/mL HSSP for 40 min (pH 12.5); (c) Treatment with NaOH (pH 12.5) for 40 min; (d) Treatment with 200 mg/mL (200 ppm) sodium hypochlorite for 40 min. Figure 4. Luminol-evoked chemiluminescence response of HSSP slurry. ●: HDP; ○: HDP+SOD. Data points with bars represent means ± standard error. including scanning electron microscopy  and epifluorescence microscopy [35,36], are not suitable for quantitative enumeration of biofilms. Conductimetric assays allow the detection of biofilm bacteria without disrupting the biofilm structure, because they detect biofilm presence indirectly via the metabolic activity of attached cells. 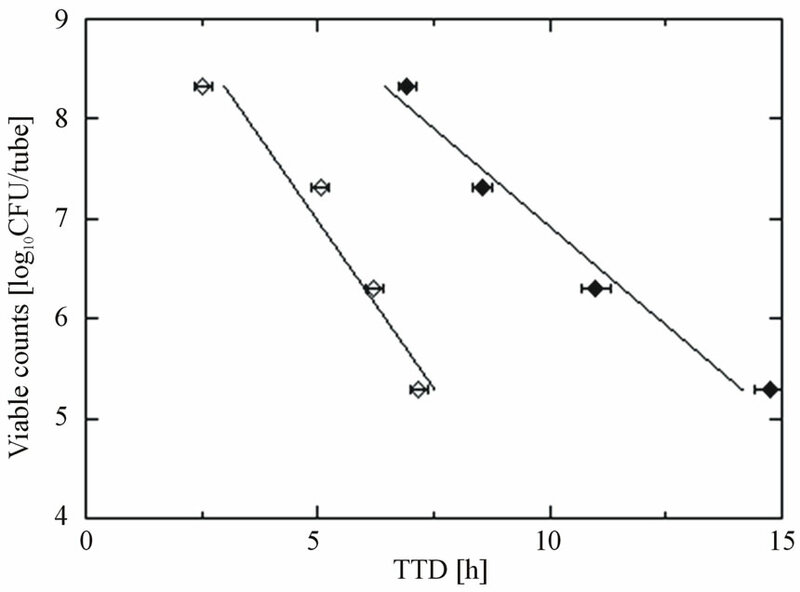 Some researchers have calculated the number of cells on stainless steel surfaces by relating the TTD to the equivalent number of cells, indicated by a standard calibration curve prepared from serial dilutions of planktonic cells [37,38]. Other studies of surface-inhabiting bacteria have also used calibration curves constructed from planktonic cell suspensions [39-41]. In fact, the metabolic activity of cells in biofilms is very different from that of planktonic cells, because a biofilm is a microbial-derived sessile community. The cells in biofilms are attached to a substratum, an interface or to each other, and are embedded in a matrix of extracellular polymeric substance. They also exhibit altered growth trends, gene expression, and protein production [42,43]. More evidence is needed to verify that the conductimetric assay can accurately enumerate actual biofilm populations. However, this assay may prove effective for indirectly evaluating intact biofilms, where the bacteria are retained on the substrates. The current study investigated these issues by calibrating both planktonic cells and cells attached to the plate. As shown in Figure 2, the TTD shortens with increasing initial number of inoculated E. coli cells, regardless of whether the cells are suspended or attached. However, the calibration curves derived from both cell types are markedly different. The calibration curve of the attached cells shifts to the right and has a gentler slope than that of the planktonic cells. In this case, the conductivity changes are contributed by the bacterial metabolism of both biofilm and planktonic cells. The planktonic cells in the RABIT tubes were derived from attached cells. As the cells proliferated on the glass plate, some of them likely detached from the biofilm structure, becoming planktonic. These dynamics are reflected in the calibration curves, which linearly correlate with the initial number of cells inoculated on the glass plate. As mentioned in Section 3, for a given TTD, the calibration curve derived from the planktonic cells underestimates the population of E. coli cells in the biofilm by two or three orders of magnitude. For this reason, the viable cell counts in biofilms exposed to HSSP were estimated from the attached-cell calibration curve. The ability of HSSP to disinfect the biofilm was nondestructively measured by the conductimetric assay. According to these results, HSSP is highly effective at disinfecting the E. coli biofilm. In previous studies [13,44], populations of E. coli and coliform bacteria on sprouts and fresh vegetables were significantly decreased following treatment with heated powder derived from scallop and oyster shells. For instance, coliforms inhabiting shredded cabbage were almost completely eliminated within 5 min of HSSP treatment (<10 CFU/g) . Bari et al. applied heated shell powder and sodium hypochlorite (200 ppm) to tomato surfaces inoculated with E. coli O157:H7. Treatment with 200ppm sodium hypochlorite and heated shell powder reduced the E. coli O157:H7 populations by 3.40-log10 and 7.85-log10, respectively. The results of our study are consistent with the above-mentioned results for fresh products; HSSP is more effective against E. coli biofilm than sodium hypochlorite. Collisions between HSSP and the biofilm may have stripped some of the biofilm from the plate, contributing to the disinfectant effect. The impact of this phenomenon was investigated by treating biofilm with silica particles of the same particle size as HSSP. Silica powder possesses no antibacterial activity. The silica exerted no adverse effect on the biofilm (data not shown), indicating that the disinfection efficacy of HSSP treatment did not depend on physical contact with the E. coli biofilm. Whether the disinfection efficacy of HSSP against E. coli biofilm was due to biofilm stripping or bactericidal effect cannot be determined from the conductimetric assays. Under disinfecting stress, biofilm cells may enter the viable but non-culturable (VBNC) state . 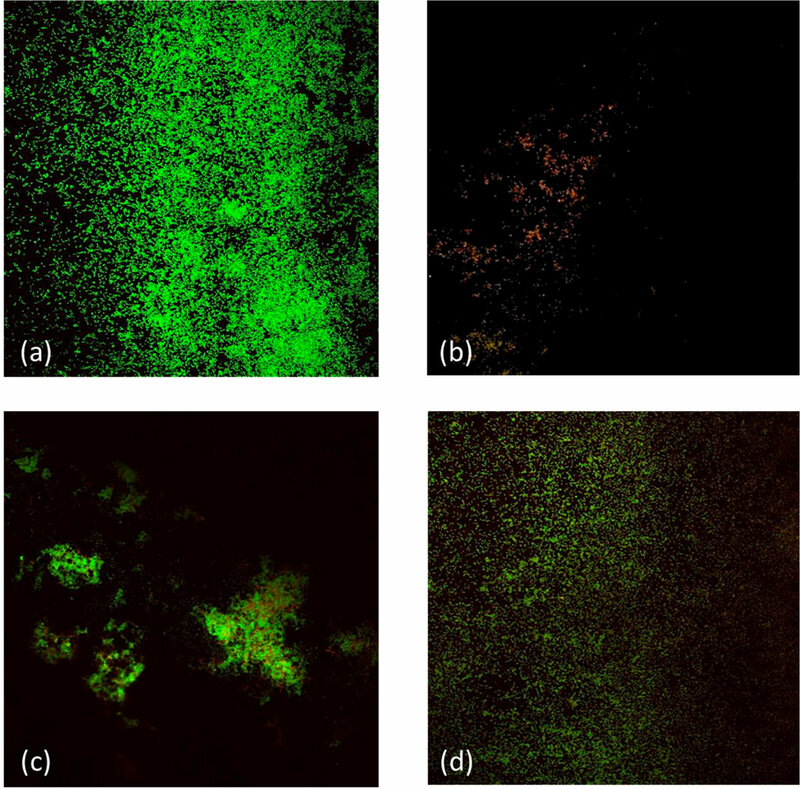 Instead, the disinfection effect of HSSP against biofilms was determined from the viability of the E. coli cells remaining on the plate after HSSP and other treatments, estimated by fluorescence microscopy. Fluorescence microscopy confirmed the absence of viable cells on the plate following HSSP treatment, in the cases where no TTD was detected. Although alkaline and sodium hypochlorite treatments stripped large portions of the biofilm, they retained many viable cells on the plate, consistent with the results of the conductimetric assay. Considering that E. coli ATCC 25922 is a useful surrogate for E. coli O157:H7 , the presence of viable cells in biofilm treated with sodium hypochlorite, which is commonly used to disinfect fresh vegetables and preparation equipment, presents a serious food hygiene problem that could lead to E. coli O157:H7 outbreaks in fresh vegetables [45,46]. Although CaO hydration, which generates alkaline conditions, is considered as the primary action mechanism of HSSP, the HSSP disinfected E. coli biofilm much more effectively than NaOH at the same pH (see Table 1). One possible reason for the high disinfection efficacy of HSSP is that the pH of the thin water layer formed around HSSP particles is much higher than that of the equilibrated solution [47,48]. When the HSSP particles contact the biofilm, the damage caused by highly concentrated OH- groups in this thin aqueous surface layer might remove or kill bacterial cells. However, according to previous studies, CaO or MgO powder slurries, unlike other alkaline treatments, increase the sensitivity of E. coli to chloramphenicol and rifampicin . Mendonca et al. reported that E. coli, S. enteritidis, or L. monocytogenes cells are insensitive to high pH agents, and grow well in alkaline environments on both selective and non-selective media. They proposed that high pH exerts an all-or-nothing effect. This idea is supported by our previous study of alkaline treatment , and suggests that alkalinity is not the sole antimicrobial property of HSSP. Powder slurries of CaO and MgO generate active oxygen species such as superoxide anions [26,51, 52]. The altered sensitivity of E. coli treated with CaO or MgO is consistent with that induced by active oxygen treatment . Thus, active oxygen species could also largely contribute to the antibacterial activity of CaO and MgO. A multi-parameter flow cytometry study conducted by Hewitt et al. supports these conclusions. Although high pH is certainly the main contributor to the antimicrobial activity of HSSP, active oxygen species generated from HSSP are also likely antimicrobial factors. How the active oxygen is produced is poorly understood at present. Krishnamoorthy et al. investigated the antibacterial activity of MgO, which, like CaO, is an alkaline-earth metal oxide. They suggested that the antibacterial activity of MgO relies on the presence of defects or oxygen vacancies at the surface. Since MgO is readily hydrated and forms a surface layer of Mg(OH)2, it readily establishes surface-bound electron-hole pairs that can decompose into a surface trapped electron and a localized hole state [55,56]. Thus, MgO behaves as a typical oxide catalyst, reacting with molecular oxygen (O2) to form superoxide radicals . The mechanism by which alkaline-earth metal oxides such as CaO and MgO exert their antimicrobial effects requires clarification by further study. In this study, we investigated the disinfection efficacy of HSSP against E. coli ATCC 25922 biofilm by the conductimetric assay. The disinfection efficacy of HSSP on the biofilm could be non-destructively determined based on the attached-cell calibration curve. This study has verified that HSSP effectively disinfects and removes E. coli ATCC 25922 biofilm. Because this strain is a wellknown surrogate strain of E. coli O157:H7, the findings of this study suggest that HSSP treatment could also effectively control E. coli O157: H7 biofilms that present hazards in the food industries. Scallop-shells are used in food additives, and also in plastering and paving materials. However, most of the shell is considered as commercial waste in Japan and Korea . In scallop-harvesting districts, large numbers of shells are heaped near the seaside, creating offensive odors and soil pollution from heavy metals that leach out of the viscera. Therefore, new applications for scallop shells need to be developed. The use of HSSP in food processing provides a source of minerals and prolongs the shelf life of foodstuffs. Moreover, reducing the amount of scallop shell waste would reduce the related pollution problem. P. Fatemi and J. F. Frank, “Inactivation of Listeria monocytogenes/Pseudomonas Biofilms by Peracid Sanitizers,” Journal of Food Protection, Vo. 62, No. 7, 1999, pp. 761- 765. A. Mustapha and M. B. Liewen, “Destruction of Listeria monocytogenes by Sodium Hypochlorite and Quaternary Ammonium Sanitizers,” Journal of Food Protection, Vol. 52, No. 5, 1989, pp. 306-311. P. M. Griffin and R. V. Tauxe, “The Epidemiology of Infections Caused by Escherichia coli O157:H7, Other Enterohemorrhagic E. coli, and the Associated Hemolytic Uremic Syndrome,” Epidemiologic Reviews, Vol. 13, No. 1, 1991, pp. 60-98. J. Sawai, H. Shiga and H. Kojima, “Kinetic Analysis of Bactericidal Action of Heated Shell Powder of Scallop,” International Journal of Food Microbiology, Vol. 71, No. 2-3, 2001, pp. 211-218. J. Sawai, M. Satoh, M. Horikawa, H. Shiga and H. Kojima, “Heated Scallop-Shell Powder Slurry Treatment of Shredded Cabbage,” Journal of Food Protection, Vol. 64, No. 10, 2001, pp. 1579-1583. J. Sawai, H. Miyoshi and H. Kojima, “Sporicidal Kinetics of Bacillus subtilis Spores by Heated Scallop Shell Powder,” Journal of Food Protection, Vol. 66, No. 8, 2003, pp. 1482-1485. J. K. Kim and M. A. Harrison, “Surrogate Selection for Escherichia coli O157:H7 Based on Cryotolerance and Attachment to Romaine Lettuce,” Journal of Food Protection, Vol. 72, No. 7, 2009, pp. 1385-1391. D.W. Thayer and G. Boyd, “Elimination of Escherichia coli O157:H7 in Meats by Gamma Irradiation,” Applied and Environmental Microbiology, Vol. 59, No. 4, 1993, pp. 1030-1034. S. Duffy, J. Churey, R. W. Worobo and D. W. Schaffner, “Analysis and Modeling of the Variability Associated with UV Inactivation of Escherichia coli in Apple Cider,” Journal of Food Protection, Vol. 63, No. 11, 2000, pp. 1587-1590. R. Eden and G. Eden, “Impedance Microbiology,” Research Studies Press, Letchworth, 1984. V. K. Dhir and C. E. R. Dodd, “Susceptibility of Suspended and Surface-Attached Salmonella enteritidis to Biocides and Elevated Temperatures,” Applied and Environmental Microbiology, Vol. 61, No. 5, 1995, pp. 1731- 1738. E. Giaouris, N. Chorianopoulos and G. J. E. Nychas, “Effect of Temperature, pH, and Water Activity on Biofilm Formation by Salmonella enterica Enteritidis PT4 on Stainless Steel Surfaces as Indicated by Bead Vortexing Method and Conductance Measurements,” Journal of Food Protection, Vol. 68, No. 10, 2005, pp. 2149-2154. T. M. Mosteller and J. R. Bishop, “Sanitizer Efficacy against Attached Bacteria in a Milk Biofilm,” Journal of Food Protection, Vol. 56, No. 1, 1993, pp. 34-41. L. R. Beuchat, “Survival of Enterohemorrhagic Escherichia coli O157:H7 in Bovine Feces Applied to Lettuce and the Effectiveness of Chlorinated Water as a Disinfectant,” Journal of Food Protection, Vol. 62, No. 8, 1999, pp. 845-849. K. Sugiyama, T. Suzuki and T. Satoh, “Bactericidal Activity of Silicate-Containing Hydroxyapatite,” Journal of Antibacterial and Antifungal Agents, Vol. 23, No. 2, 1995, pp. 67-71.